Excluding side-quests Kashyyyk may be the shortest planet of all of them. That doesn't mean however that it is the easiest. Usually I do Kashyyyk second right after Tatooine. Anways just like Tatooine, upon arriving upon Edean you will be required to pay a docking fee of 100 credits, and as before if you have a few ranks in persuade, or affect mind you can wave that fee. Again there is no impact to your alignment in any case. At several locations on Kashyyyk Zaalbar will initiate conversation with you about his past. If he isn't with you one of your companions will bug you about including him in your party. The reality however is that it doesn't matter in any case as you are forced into his side quest in order to proceed. Anyways since there obviously isn't a starmap in the treetops you have no choice but to make it down into the Shadowlands. Head east to the Great Walkway and proceed forward. Mind the mines as well as the Czerka patrol. The Czerka won't attack on sight, but you can easily provoke them into one if you wish, for LSP or DSP depending on how you go about it. Click here for more details. Once past them if you attempt to go south to the basket down to the Shadowlands you will be stopped by a guard Wookie that won't let you pass. This leaves you with no choice but to go toward the Village of Rwookrrorro. Again mind the Dark Jedi right outside the entrance of the village. Unprepared they can do some damage, so make sure you buff up your entire party before confronting them. Once past the Sith, approach the guard in front of the village gate to be taken to see Chuundar automatically. You may want to unequip Zaalbar of all of his stuff before doing this as he will remain unavailable until you finish the Chieftain in Need side-quest. In any case talk to Chuundar and he will tell you to kill a crazed Wookie in the Shadowlands. There are no conversation choices here that affect anything so say whatever you wish. Once your audience with him is over you will be escorted out and won't be able to return until later. You'll gain 225 XP for getting rid of Zaalbar. Now you have free access to both the Village as well as the Shadowlands. At this point you actually never have to return to meet Chuundar again, nor do you have to finish his request. However if you do that Zaalbar will remain unavailable for the rest of the game and you miss out on all the XP as well as Bacca's Blade, the best melee weapon you can get outside of the Yavin Station. Anyways now that you're in the village you can pick up several quests here though you won't be able to complete them yet. Move back out to the Great Walkway and head south fighting the Kinrath on the way. Once you near the southern platform you will notice three Wookies fighting the Kinrath there. Join in the fun and once defeated one of them (Chorrawl) will talk to you. You can ask him some questions if you wish, but nothing important comes of this conversation. Just keep moving south and you will see Gorwooken standing next to the basket down. Just get on the basket or talk to him to go down into the Shadowlands. At this point you may bump into Calo Nord or Darth Bandon if you have seen their cutscene. Unfortunately you won't have any time to prepare for them as dialog is initiated immediately upon arriving in the Shadowlands, so this isn't an ideal location to fight them. For strategies on dealing with these idiots see my "Big Bads" page on Calo or Darth Bandon. Once these guys are taken care of or if you didn't meet them here continue forward, fighting the Katarn as you go and you will meet Jolee. Once he takes off you can explore the entire map before talking to him again, but as you have to talk to him to proceed forward anyways just go ahead and follow him to his little hut. Once there he will have a request for you: remove the poachers. There are actually three ways of dealing with this situation. Neutral: Talk to an emitter guard and get the code to turn off the Czerka sonic device. Don't bribe him as persuasion always works unless your charisma is less than 10. If it is just cast force valor and you should be fine. Turn off two emitters and trigger a cut-scene where the poachers are chased off by the Ritual Beast. Dark: Either talk to Commander Dern and piss him off twice to have him and his guards attack you OR talk to one of the guards and threaten them once for the same result. Wipe them off the face of the planet. Really Dark: You'll need Dominate mind to do this one. Talk to any guard and have him abandon his post. The first time will requires you have affect mind, while from the second guard on you'll need Dominate Mind. You get DSP for each guard you persuade to leave. Once there are no guards left Commander Dern will leave. Now that you are here in the Lower Shadowlands you can finally complete the remaining side-quests available on Kashyyyk. Move forwards and you'll see a couple of Mandalorians attacking a Wookie. Helping the Wookie will net you LSP but is the only way to get the "Hidden Hunter's" Sidequest. Anyways no matter how you deal with that situation proceed forward to the southwestern most corner of the map killing any opposition along the way. There are a couple of mines near the Star Map so watch out once you get close. The prisoner's gambit, pitting you against Zaalbar. If you both stay silent you both get 1 year. If you both accuse each other you both get 2 years. If one accuses the other, then the accused gets 5 years and the other gets none. The correct answer is that you don't trust him and that you'll accuse him. You'll gain a small amount of DSP for this answer. The incorrect answer here does nothing. You can still proceed with the evaluation but you won't get any LSP for the good answer. What will you do in a war where you can either defend one of your cities at the cost of being able to attack a key one of theirs or vice versa. Saying you will defend the city will net you some LSP, but you will fail the evaluation. What will you do if you discover a single impending attack against your stagnating empire. The correct answer is to let the attack happen for DSP, upon which you will pass the evaluation and gain access to the Star Map. Again as before saying that you will stop the attack will net you LSP but you will fail the evaluation. If you pass you'll automatically gain access to the Star Map while if you fail, then two defense droids will be summoned. Take them out and talk to the Computer again and you will be granted access to the Star Map. The defense droids can be tough, but since you have Jolee it shouldn't be a problem as his disable droid power will stop them in their tracks. They grant a large amount of XP so it is usually advisable to fail on purpose. The way to get the most LSP is to fail the first question, choose the correct answer for the second question (answering that victory is irrelevant) and then fail the third question. For Darksiders they just have to answer each question correctly for the most DSP, however as stated above you gain more XP by failing anyways so usually I just reject the last question. Pass or fail, you'll now have Kashyyyk's Star Map and an extra 2800 XP to boot. Go ahead and finish any side quests, and leave this rotten place behind forever. As Tatooine difficulty here is (again) a function of level. The kinrath only attack in small groups at lower levels and are easy to handle. However the Katarn are a bit more difficult. 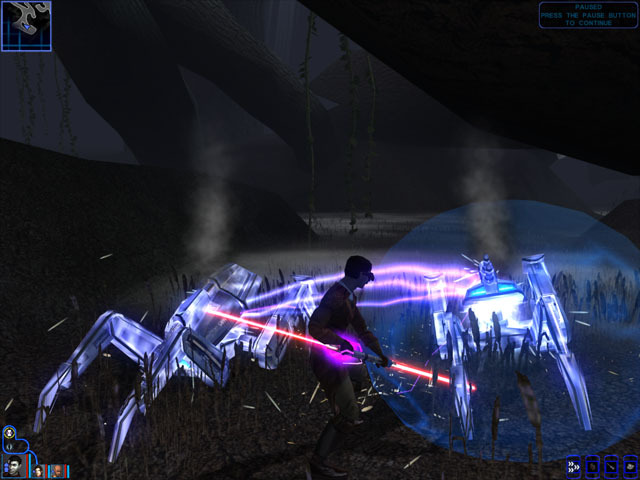 Below level 12 they are pretty easy to take out, but once you start facing the Dire Katarn they start to dish out the pain. While the encounters increase in difficulty again at level 15, the new force powers you gain more than make up the difference. Melee and Attack builds: The melee builds do quite well here, but care must be taken not to bite off more than you can chew. As always take things one at a time, and you should be able to wipe out the enemies easily. Again debilitate your enemies wherever possilble, especially for those builds that are built to do sneak attacks. Consulars: Since this area can get rather crowded, at high levels Consulars will have a cake walk here. Multi-target force powers are at their most effective here, and powers such as force lightning and force wave can quickly decimate whole populations of kinrath.